Apple blew away analyst estimates today in the 2012 Q1 financial results call reporting $43.66 billion in revenue and $13.06 billion in profit for the quarter. These numbers are phenomenal; the biggest in company history. Apple made more in Q1 of 2012 than it did in half of 2011. On the iPad front, Apple announced the sale of 15.43 million iPads this past quarter, up 111% from Q1 2011 earning Apple $9.1bn in revenue. 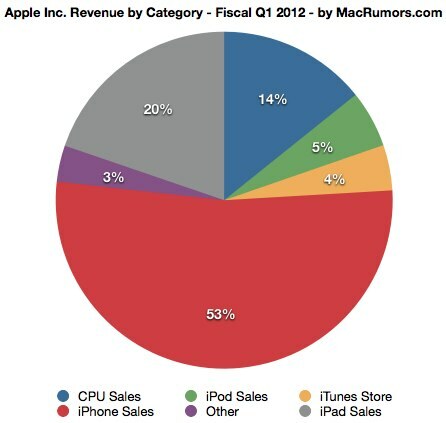 Pretty remarkable that the iPhone and iPad account for 73% of Apple’s revenue. We’re really happy with the 15.4 million iPads that we were able to sell. This is consistent with our long term belief that we’ve had since before we launched the iPad that this is a huge opportunity for Apple. I believe that there will come a day that the tablet market will be bigger than the PC market. Cook pointed to IDC’s recent study showing that tablet sales exceeded desktop PC sales in the US and remarked that there is significant momentum in this space. In terms of competitiveness, he pegged the iPad in a class of its own. We now have 70,000 apps, compared to a few hundred for the competition. People really want to do multiple things with their tablets, and we don’t see these limited function tablets and e-readers in the same category. We don’t think people who want an iPad will settle for limited function. Last year was supposed to be the year of the tablet, and most people will agree it was the year of the iPad. We’re going to continue to innovate like crazy in this area. There is cannibalization of the Mac by the iPad, but we continue to think that there’s much more cannibalization of the PC by the iPad.” In K-12, we sold twice the number of iPads as we did Macs. iPad continues its unprecedented adoption in business. Nearly all of the top companies in all industries [from pharma to retail] use iPads [in the field]. Propelics will have more analysis on the ramifications of these results in a future blog post. Needless to say, the iPad has momentum. Enterprises need to be able to handle the increasing wave of BYOD, they need to have policies around the provisioning of corporate liable devices, and most importantly, businesses need to innovate on this form factor. Innovating on the iPad for corporate gain will soon (not yet) turn from a means for advantage to one of competitive necessity. Transcript of today’s earnings call available at the Verge blog.